The 14th film in the Marvel Cinematic Universe is based on the Marvel Comics superhero character 'Doctor Strange'. Strange was a talented neurosurgeon that lost his skills in a horrible car accident. He seeks help from a Sorcerer, called The Ancient One, to heal himself; and in the process he gains mystic super powers. The movie stars Benedict Cumberbatch, in the title role, and it costars Chiwetel Ejiofor, Rachel McAdams, Tilda Swinton, Mads Mikkelsen, Benedict Wong, Michael Stuhlbarg, Scott Adkins and Benjamin Bratt. It was written by Scott Derrickson, Jon Spaihts and C. Robert Cargill, and it was directed by Derrickson (Derrickson has previously directed, and co-written, such popular horror flicks as 'SINISTER', 'DELIVER US FROM EVIL', 'THE EXORCISM OF EMILY ROSE' and 'HELLRAISER: INFERNO'). The movie has been a huge blockbuster at the Box Office (much like all Marvel Studio films), and it's also gotten mostly positive reviews from critics. I liked it. 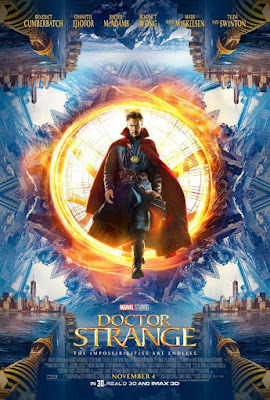 Stephen Strange (Cumberbatch) is a very successful neurosurgeon, that's horribly wounded in a disastrous car accident; losing the use of his talented hands. In a desperate effort to try and heal himself, Stephen travels to Kamar-Taj; and meets a powerful sorcerer called the Ancient One (Swinton). She teaches Strange her powerful mystic abilities; and Strange also learns that the world is under attack, by other evil sorcerers. The doctor might also be one of the only people that can stop them. The movie is just as fun, and entertaining, as most Marvel Studio superhero films. This one is cool because it's a little different; like they all are, but this one feels even more so. Despite it's fresh uniqueness, the film still suffers from a lot of the usual Marvel action film cliches; and overuse of CGI. It does always look cool, but it also loses a lot of it's freshness; in it's overuse of CGI. For the most part though, it's a well made (and fun) superhero action movie.